This may seem a little industrious for Soulsubsistence, but while waiting for the snow-sleet-hailstone nightmare to stop (perhaps stupidly, this is Cumbria) before the dog gets her daily gallop, I thought I would share this rocking chickeny salady thing. There’s better flavour in on-the-bone meat anyway, so picking up the cheaper thigh and drumsticks is a great way to get organic and free range chicken without having to save for them. The other bugbear that gets me wrapped up in a rant is people who think about what they would like to eat, and then go out to buy it, leaving a refrigerator stocked high with all kinds of perfectly servicable ingredients. The best (and most economic) way to cook is to stick your head in the fridge and see what you’ve got. That’s what happened here, but it mainly occurs every night in this house. I was told recently that it’s more of a skill than I realise; that ‘normal’ people don’t always have the ability to concoct what they want to eat from an array of leftovers and vegetables, but I think it’s more about practice than anything else. It’s a mindset, and it can be broken to great effect. Take a couple of cooked chicken drummers, strip the meat and throw in a suitably-sized bowl. Thinly slice a generous handful of spinach, and mix with the chicken. 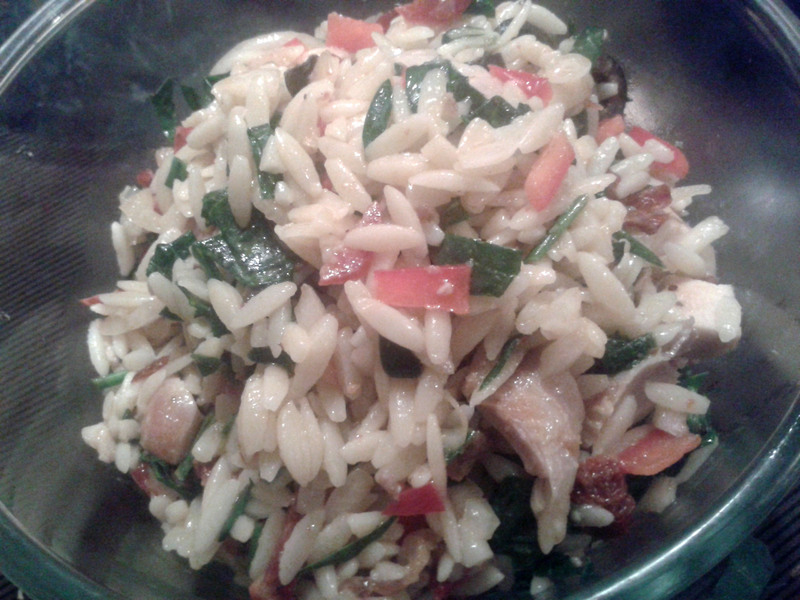 Get the pasta on to cook – I picked orzo as a shape; little rice-shaped pieces, but really, any shape will do. Quantity? How hungry are you? Slice up or dice a small onion, chop some sun-dried tomatoes, a piece of red pepper, and cut up a handful of black olives into halves. Slice – super-thin – about an inch of chorizo. More if you’ve made enough pasta for the 5,000. Wang the well-drained pasta into the chicken and spinach while it’s still hot, because it will wilt the spinach ever-so-slightly. Add in the rest of the chopped ingredients (and remember that other additions will work beautifully too) and mix until it’s all looking pretty even. I love vinaigrette dressings to a fault. 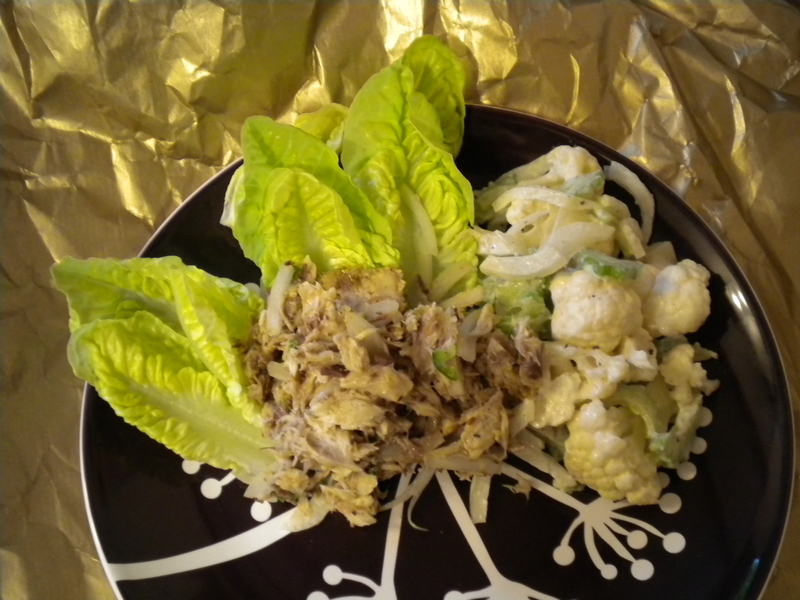 I’m sure a creamy, mayonnaisy dressing would be lovely with this, but since I’ve eaten almost a kilo of mayo in the past month (oh, glorious King Edward potato salad, how do I love you, let me count the ways …), I decided to go with vinaigrette. Using the almost empty jar of English mustard, I tipped in a few tablespoons of red wine vinegar, a teaspoon of sugar, a couple of teaspoons of balsamic vinegar, a hefty pinch of dried basil, about a clove of grated garlic, a large pinch of Maldon salt, and added EVOO at the rate of approximately three-times the quantity of red wine vinegar (the balsamic is more ‘to taste’). Give it a good shake so it emulsifies, taste it, adjust if necessary (good luck with that, I don’t have any tips for dressings, they’re my nightmare) and add cautiously to the salad, tossing it as you go. Eating in Mum’s home has mainly been great. Of course, there have been a few odd disasters, here and there, but none that really stick in the craw. Cooking in the Murdock household has always been about flavour and quality, even when we were teenagers and ate tonnes of plastic bread and margarine on the side. If flavour means that a few bones or stones get left in, so be it; mum hasn’t got the patience to fish them out (poor dad, how he has suffered) and she’s sure it improves everything. The guaranteed meal to cause fights over the last few droplets of sauce; the one which is devoured in mere morsels of time is my mum’s Prawn Sauce. Magpie has to admit with shame that she has no definitive idea as to how mum makes it. It appears to be a roux and we know most of the liquid comes from fish stock bouillon but whenever she’s eaten it made by Magpie, Mother has declared that it’s not quite right. Whatever the method, the recipe below is as close to the real thing as Magpie’s imagination can take us. Since we only ate it at Mum’s house under a week ago, we can both testify that this one tasted the same, at least to our uncouth tastebuds. Serves: seriously, this serves 2. If there are more of you, you need more of everything. Make up about 450ml fish bouillon, using a fish stock cube. Saute some onion and garlic until soft. You can either leave them in the pan or reserve them for later. Gently melt about 1oz butter and stir in just under 1oz plain flour to make a paste. Stir in a couple of teaspoons of tomato puree and heat gently, scraping the wooden spoon or curly whisk across the bottom of the pan. Stir, stir, stir; the flour and puree must cook. Take it off the heat for a moment and begin to incorporate the stock, a little, then more, then still more, vigorous stirring is the name of the game. Keeping the heat at medium, stir until the sauce thickens. Add the onions et al to the sauce if you reserved them earlier and let them cook in the unctuous, orange sauce. 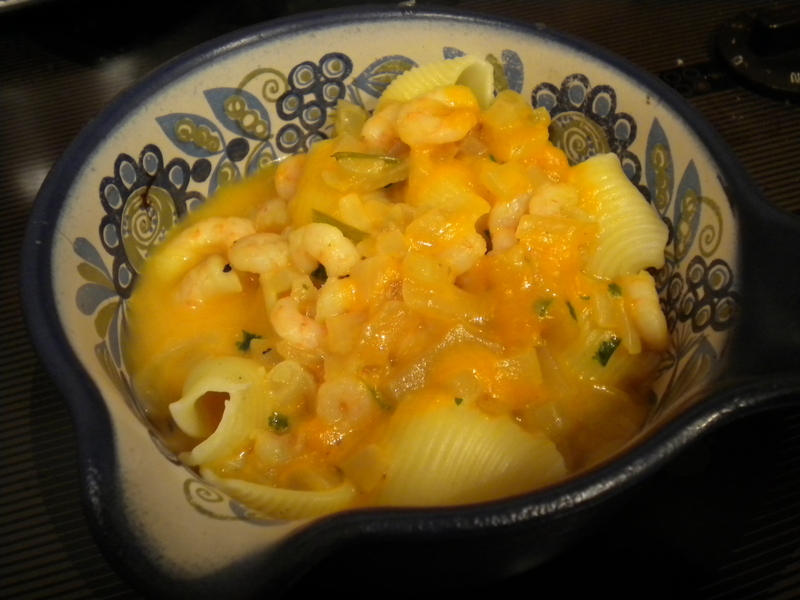 Cook the pasta – big shells are best because they hold the most sauce and whole prawns. Take the sauce off the heat and add about 180g bag frozen, cooked, coldwater prawns (shrimps in the States) and a handful of parsley. For the first five minutes that the pasta is cooking, just let the shrimps defrost in the sauce. As the pasta reaches the halfway cooked point, put the sauce back on a gentle heat and allow it to go as far as boiling for a few seconds. Stir it around as it begins to bubble quietly. The prawns require protection from being boiled. Their short existence before death gives them the right to expect freedom from being overcooked. What a waste of a death is an overcooked food, whether it’s steak, a dry turkey or bacon burnt to a cinder. Prawns shouldn’t be rubbery or chewy. They aren’t Haribo sweets; they were living creatures before and they deserve a better destiny. They shouldn’t be curled up tight, with the texture of a power ball. Their flesh should have bite, with malleable resistance between the teeth. Inscisors should be able to slice straight through them – they shouldn’t need grinding and scraping through molars. Okay, we’re done with the lecture. Treat the prawns in this sauce with respect. They just need heating through, not boiling to double death. Get the pasta into the bottom of a couple of deep dishes and ladle the green speckled, orangey sauce over the shells. *Glossary: Hellbits: that which if we knew what went into them, we wouldn’t feed the cat. Not even a mangy, stray ginger tom. Like kitbits but without the cute kitten commercials and added vitamins. Now with NEW freezedried chicken brains!